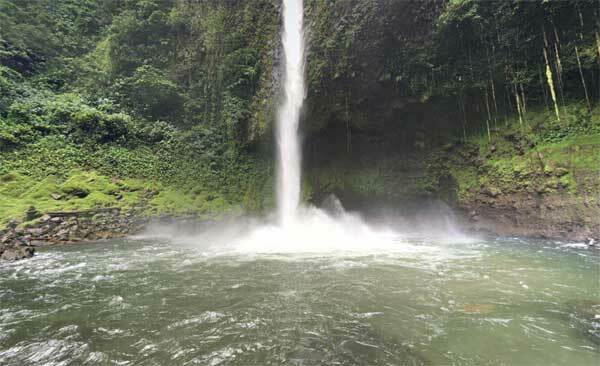 La Fortuna is located about three hours northwest of the capital of San José, Costa Rica’s Arenal region has been drawing eco-minded travelers in search of opportunities for wildlife watching, jungle hiking, water sports, and other activities for decades. But it’s also become much more than a tourist destination, attracting an increasing number of expats interested in making permanent homes here. They are drawn here by the peace and serenity. No trafﬁc. No crowds. Just a small-village atmosphere. The tourist hub of La Fortuna de San Carlos sits six miles from the volcano’s base on the eastern side. The volcano is a spectacular sight, a cone rising 5,479 feet out of forest and farmland, that is active, but not dangerous. A side benefit of the volcanic activity is that thermal hot springs abound in the area. Known locally as aguas termales, the 90 F to 110 F waters are naturally heated by volcanic activity. 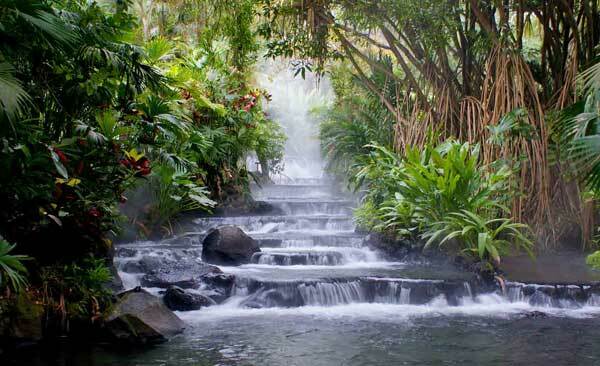 In fact, most of the hot springs have a great view of the Arenal volcano from the pools. This area has about a dozen different hot springs you can visit, ranging from deluxe locations with attached spas (most feature volcano mud treatments) to more budget facilities favored by locals. Many line the road heading west out of the tourist town of La Fortuna towards Lake Arenal. The waters themselves, thanks to the minerals, are said to have medicinal properties and alleviate arthritis, certain heart conditions, and other ailments. But whether that’s true or not, the warm waters undoubtedly have a positive effect on any stress or tension you’re feeling. Plus, it’s the perfect way to soothe sore muscles at the end of a day trekking or traveling. To get from La Fortuna to the shores of the lake takes about 30 minutes. Nuevo Arenal, a village popular with visitors and expats about midway along the northern shore, is another 30 minutes along the curvy lakeshore road. There are plenty of cafes, artisan galleries, and restaurants you’ll pass that are worth a stop. La Fortuna is the largest town in this region. As such, it offers a variety of amenities and services you won’t find elsewhere. There are well-equipped medical and dental clinics, including emergency care. It also features several large grocery stores and markets that carry fresh produce, as well as imported items. There are also banks and gourmet restaurants. Although most expats only come into town for errands, many tourists to the area stay in La Fortuna because it features a range of accommodations, from budget hostels to high-end hotels. It is also headquarters for many tour companies who offer a range of adventures in the area, which has a larger national park around the base of the volcano. There is ziplining, whitewater rafting, jungle trekking, wildlife watching, spelunking, kayaking and standup paddle boarding on the lake, and more. La Fortuna and the Arenal area does get its share of hot days, but for the most part the weather year-round in the area can be described as “spring-like.” Comfortable daytime temperatures in the 80s…cooling off at night. Most people here do not use air conditioning. Instead they open windows and sliding doors to bring in fresh air and cooling breezes. The great weather means a lot of living and entertaining is done outdoors—in tropically landscaped gardens, terraces, or back porches. Expats here eat meals outside, enjoy that first cup of coffee in the morning overlooking the lake, and watch sunset over a glass of wine. There can be heavy rains here at times…this is the tropics after all. But most expats welcome the water because it nourishes the vegetation and really brings out the different shades of green in all the trees and other plants. Wildlife, including toucans, coatimundis, and other species thrive in the natural areas here. Jillian Feibusch knew early on that there was a better life to be had other than living in the craziness of the San Francisco Bay Area. “I was working as a makeup artist for Chanel. Because of the high cost of living, daily commute, health issues, and the intense desire to do something more with my life, I moved to Costa Rica so I could breathe,” she says. In 2013, Jillian vacationed in Costa Rica and was pleasantly surprised at how she was able to do so much more physically than her heart condition allowed her to do in the U.S. So much so that a couple of months later she purchased a one-way ticket to Costa Rica, rented a car and hotel for two weeks, and the rest as they say is history. Jillian made the quaint town of La Fortuna her home. “La Fortuna had everything to make everyday life manageable and that’s what I was looking for,” she says. The small, yet bustling town was a far cry from the mega city she had left behind. Plus there was the added bonus of living at the base of Volcán Arenal (Arenal Volcano). “The Energy of Volcán Arenal was it for me. The chance to live so close to this stunning beauty was the experience I was looking for,” Jillian says. While La Fortuna caters mostly to the tourists, the majority of expats in the Arenal region live around the 33-square-mile Lake Arenal. The shoreline is unspoiled. And the green field and forest on the hills that drop to the lake are dotted with homes. Along the lake road you’ll find eco-lodges, B&Bs, and boutique hotels. There are only a few villages, settlements, and developments that bring together more than a few structures in one place. Nuevo Arenal, on the north shore, is a tidy village with a gas station, bank, pharmacy, grocery stores…most everything you need for daily living. Tronadora and San Luis are small villages on the opposite shore to Nuevo Arenal with simple but very affordable homes. They have a church, soccer field, and tidy, spotless houses…and not much else. Tilarán is about 20 minutes inland from Tronadora. It’s bigger, with larger stores and more medical care. Although in-depth medical care, shopping malls, government services, and airport access—while not around the corner—are within easy driving distance. If you live on the northern and eastern sides of the lake, your best bet is to head to San José and its suburbs. If you’re on the other side, near Tilarán or Tronadora, follow the lead of expats there and head to Liberia. It’s only about two hours away. You can get dental and medical care in La Fortuna, the tourist town about 15 minutes east of the lake, and in Tilarán, about 20 minutes inland from the southwestern shore. But for surgeries and procedures, you’ll have to travel.